In 1963, Hans Hofmann, age eighty-three, arranged to give forty-five paintings and a very substantial sum of money to the University of California at Berkeley. The funds were intended to help build a new museum on campus where the donated works could be exhibited. It was the fulfillment of the legendary teacher and painter’s long-held desire to have an institution care for a substantial group of his best works, and the culmination of an even longer connection with Berkeley’s art department and many of its faculty. That connection began in 1930, when Worth Ryder, an instructor at Berkeley who had studied at Hofmann’s progressive Schule für Bildende Kunst (School of Fine Art) in Munich, invited his former teacher to lead a summer art course at the California university—a very attractive alternative to the rigors of Germany at the time, despite the growing fame of the Munich school. Hofmann returned to Berkeley the following summer to continue teaching and to have his first American exhibitions, shows of black and white drawings made during his American sojourns and in Europe, held at the Berkeley art department and at San Francisco’s California Palace of the Legion of Honor. In the summer of 1932, Hofmann returned to the United States again to teach, this time at the Chouinard School of Art in Los Angeles, and then traveled to New York to teach at the Art Students League. He never returned to Germany. In 1934, Hofmann opened the New York incarnation of the Schule für Bildende Kunst in Greenwich Village. The following year, he inaugurated a summer school in Province-town, Massachusetts, following a tradition of summer sessions in picturesque places that he had initiated when he ran his Munich school. Many Berkeley faculty members attended the Provincetown sessions, including a few who had been students in his first classes there. Returning to the West Coast, they, in turn, emulated Hofmann’s teaching methods and transmitted his conceptions of what a painting could be to their students. It was this continuous link, as well his gratitude to Berkeley for providing his initial introduction to America, that prompted Hofmann’s munificent gift. For decades, Berkeley’s Hofmanns were a major attraction to the campus, installed in the museum for which he had provided the seed money. That building, unfortunately, was found to be seismically unsafe almost thirty years after its inauguration, and in 2016 it was replaced by a new, light-flooded, Diller Scofidio + Renfro–designed Berkeley Art Museum and Pacific Film Archive, in part ingeniously retrofitted from an existing Art Deco industrial building. Now, the ambitious survey exhibition “Hans Hofmann: The Nature of Abstraction” places more than half of Berkeley’s holdings in the context of an impressive selection of other canvases, watercolors, and works on paper, from public and private collections throughout the United States.1 Organized by the Berkeley Art Museum’s Curator Emerita Lucinda Barnes and Curatorial Assistant Matthew Coleman, the handsomely installed show spans most of Hofmann’s life as artist, from the 1920s to just before his death early in 1966. Berkeley’s stellar examples, chosen by the painter himself, never looked this good in the old museum. The exhibition begins with one of the few surviving works to predate Hofmann’s move to America, an untitled watercolor from the 1920s—a still life whose lucid structure and bold palette of clear blues and reds, played against pale pinks and greens, are testament to Hofmann’s early interest in Fauvism and the work of Henri Matisse. It ends with the thundering Ora Pro Nobis (Pray for Us) (1964, Private collection), a classic “slab” painting with a glowing golden rectangle hovering in front of a sheet of dark paint at once tactile and infinite. The work was originally exhibited in Hofmann’s last New York exhibition, which opened just before his death a month short of his eighty-sixth birthday. In close proximity is Berkeley’s exuberant The Castle (1965), also included in the last show, an explosion of clear hues ranging from pale yellows to saturated greens and forms ranging from crisp rectangles to aggressive clumps to transparent washes, as loose and airborne as Ora Pro Nobis is confrontational and solemn. Together, the two powerful paintings bracket the wide range of Hofmann’s pictorial conceptions. Between these paradigmatic works are more than sixty canvases and works on paper, panel, and board that allow us to follow Hofmann’s path from free, energetic responses to things seen to the equally energetic, potent abstractions that cemented his reputation as a major painter, rather than a revered, influential teacher. One of the first of these, Apples (ca. 1934, Whitney Museum of American Art)—a still life that suggests Hofmann’s deep understanding of Paul Cézanne’s tabletop paintings— dates from the year Hofmann began to paint once again after a twenty-year hiatus. From 1904 to 1914, he had lived in Paris, supported by a wealthy German patron who had been impressed by the young Bavarian’s early efforts. During this heady period, when ambitious young radicals such as Pablo Picasso, Henri Matisse, and Georges Braque were inventing Fauvism and Cubism, Hofmann was part of the small international art world of pre–World War I Paris, seeing work that would resonate in his own art for the rest of his life and forming friendships with members of the vanguard. (The great mystery is why Hofmann didn’t enroll in Matisse’s short-lived school—an opportunity to work with an artist he seems to have known casually and whose work he always revered—especially since one of the people who helped organize the school was a fellow German, a painter who was almost certainly part of Hofmann’s circle.) In the summer of 1914, Hofmann and his future wife, Maria Wolfegg, known as Miz, were traveling, so they were out of France when the war began. As German nationals, they could not return to Paris. All of their possessions, including the paintings Hofmann had made during his ten-year stay, were lost. Back in Munich, his former patron no longer able to support him, Hofmann opened his school. He later described himself as not being a teacher in the usual sense but rather a painter who had to teach to sustain his art. Yet for the next two decades, he devoted himself to the school. The rigors of teaching kept him from painting. For twenty years, Hofmann almost exclusively drew in black and white; hence the works in his first American shows. He began to paint again only in 1934, when he was teaching in Gloucester, Massachusetts, invited by a former student, as he had been invited to Berkeley. Encouraged by his student Mercedes Carles (later Mercedes Matter) and her artist father Arthur B. Carles, with whom he shared a house, he began a series of landscapes. The works that soon followed are high points of “Hans Hofmann: The Nature of Abstraction”—a group of large, all-stops- out studio interiors, painted between 1935 and 1938, some of them “portraits” of amassive round table with a random assortment of props, against a background of canvases and studio furnishings. Another group plays a tall cupboard, with vases and urns placed on its top, against a painting of the cupboard on a nearby easel. The viewpoints and relationships of the depicted object and the depicted painted image of the object shift from picture to picture. One of the most dazzling is Studio Unfinished (1936, Collection of Toby Emmerich, Los Angeles), with its playful interchange between fiction and fiction of a fiction. Both Matisse and Cézanne haunt these paintings, but the saturated, slightly acidic palette and the vigorous paint-handling are Hofmann’s own, as we see throughout the exhibition. 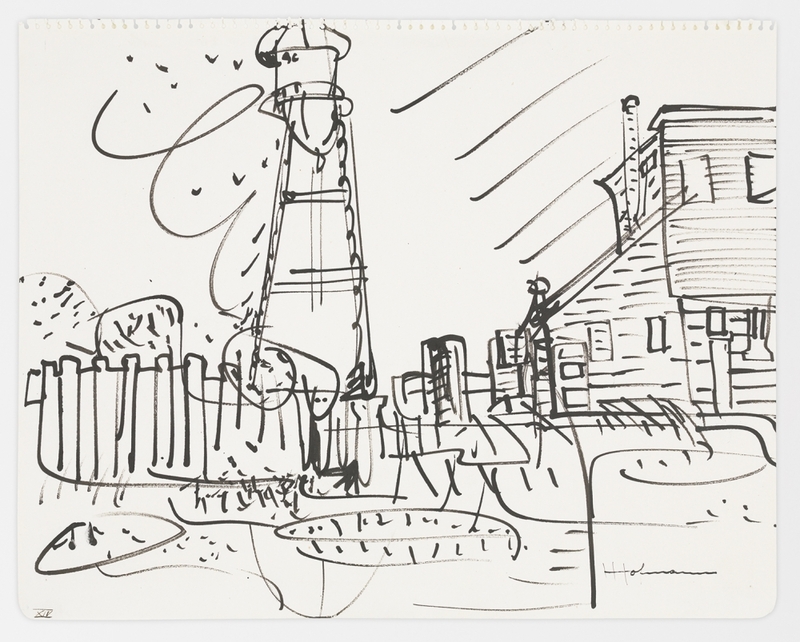 A series of Provincetown landscapes, made between 1936 and about 1942, document Hofmann’s fascination with the geography and radiant light of the Cape Cod fishing town where he spent his summers starting in 1935, especially his preference for the geometric houses and the barn-studio at the top of a hill where he first held his classes, translating New England into that super-heated palette and bold swipes of the brush. A group of Hofmann’s small, experimental poured-and-dripped paintings, mostly from the early 1940s, bear witness to an interest in non-traditional paint application typical of the period. Hofmann didn’t continue to pour or drip, although for the rest of his life he made a wide variety of paint handling part of his expressive vocabulary, just as he did a wide variety of hues. In every work in the exhibition, the history of the painting’s making is clearly an important part of its meaning, especially as recognizable imagery becomes less and less visible and abstract relationships increasingly dominate. So is Hofmann’s refusal to settle for the known or the familiar. The paintings of the 1940s and 1950s that follow range from vaguely surrealist, elusive “figures” to unfettered bursts to crisp geometry to suave organic forms to mosaics of fierce dabs and a lot in between. Paint applications vary from delicate threads to broad expanses to staccato stabs. There are wonderful paintings throughout the show, many wildly different from one another. It’s hard to believe that Berkeley’s Scintillating Space (1954) —a tall canvas with elongated, sometimes angled, red and blue geometric planes floating in a shimmering sea of thickly dabbed red, white, and blue stabs of the brush—was done in the same decade as the crisp, rectangular interior, Magenta and Blue (1950, Whitney Museum of American Art), with its loaded tabletop and trellised window: possibly a riff on one of Braque’s Billiard Table series, with which Magenta and Blue shares many allusions. Only the unmodulated, radiant color and the sense of a clean, geometric underpinning seem common to both paintings. Even the last part of the exhibition, dedicated to paintings of the 1960s, is similarly diverse. Hofmann, having finally closed his school in 1958, at age seventy-eight after more than four decades of teaching, was able to devote himself full time to painting. In his lifetime, Hofmann’s multiple conceptions of what a painting can be were not admired. In an era when artists were supposed to announce themselves with signature images—think Barnett Newman’s zips, Adolph Gottlieb’s bursts, or Franz Kline’s overscaled, clashing dark strokes—Hofmann’s diverse approaches were viewed as demonstrations of possibilities, as one might expect of a dedicated teacher. Hofmann’s standing among his peers only began to rise when the slab configurations began to dominate. Today, Hofmann’s multivalence is seen as part of his strength and originality, yet if his New York colleagues had been paying close enough attention, they would have seen the recurring ideas about composition, surface, and color that are subtly emphasized by the selection in “Hans Hofmann: The Nature of Abstraction” and that are visible whether he is improvising on the complexities of the interior of his studio in the 1930s or adjusting eloquently varied rectangles to create a metaphor for the natural world in a 1960s slab painting. We can even find hints of those rectangles in the interiors of the 1930s and at intervals throughout the exhibition. If it’s not possible to get to Berkeley before July 21, you can later see “Hans Hofmann: The Nature of Abstraction” at the Peabody Essex Museum, in Salem, Massachusetts. It’s only a couple of hours’ drive, traffic permitting, from Provincetown, where Hofmann taught for so many years and painted many of the works in the Berkeley show. Or there’s a leisurely, scenic ferry. Whichever coast you choose to visit, try not to miss this fine exhibition.